This Premium Insulated 6 Bottle Wine Carrying Case by OPUX is equipped with thermal insulated material to keep your wine at its ideal temperature during travel. Equipped with a versatile flap, this deluxe wine bag will ensure your bottles will fit regardless of size. Its detachable shoulder strap will allow you to carry this tote carrier over your shoulder or by hand. This 6 Bottle Wine Tote Carrier allows you to store more items with its front side pocket. Made from high-quality 600D polyester, this insulated bag will ensure maximum durability. This Premium Deluxe Insulated 6 Bottle Wine Carrying Case by OPUX measures 12" x 7.5" x 12.6" (L x W x H). PORTABLE WINE TRAVEL BAG - Take your favorite wine bottles with you to a restaurant, outdoors, park, beach, dinner, or party. Comes with corkscrew opener so you are always ready to enjoy your beverage! Also makes a great gift for wine lovers and hostess present. CONVENIENT AND SMART DESIGN - Features an adjustable and detachable shoulder strap along with padded hand straps for different carrying styles. Interior versatile flap ensures that your wine bottles will fit regardless of size and offers padded divider protection. Beautiful And Durable - Made from high-quality 600D polyester to ensure maximum durability and PU leather trim for a touch of elegance. This wine bag is classic yet stylish. 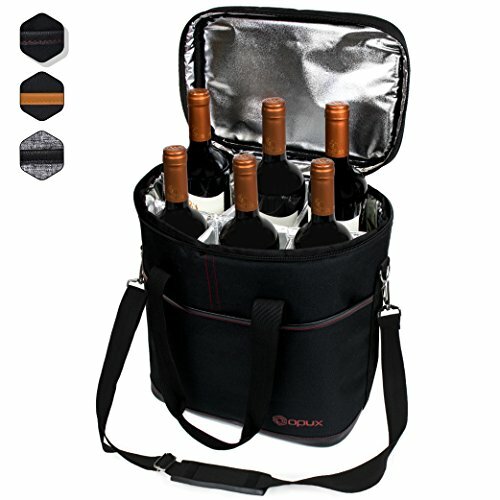 This Premium Insulated 6 Bottle Wine Tote Carrier by OPUX measures 12" x 7.5" x 12.6" (L x W x H). Fits most standard 750ML wine bottles. If you have any questions about this product by OPUX, contact us by completing and submitting the form below. If you are looking for a specif part number, please include it with your message.